The General Ship & Engine Works crew during the construction of "The City of Burlington," which would become one of the Streamline Ferries on Lake Champlain - April 29, 1936. Carl G. Hedblom, father of Byron Hedblom, stands on the right in a suit with his hat in his hand. Third in from the right in the front row wearing a checkered jacket is Carl Roessler, Byron's bother-in-law (He married Ruth Hedblom). 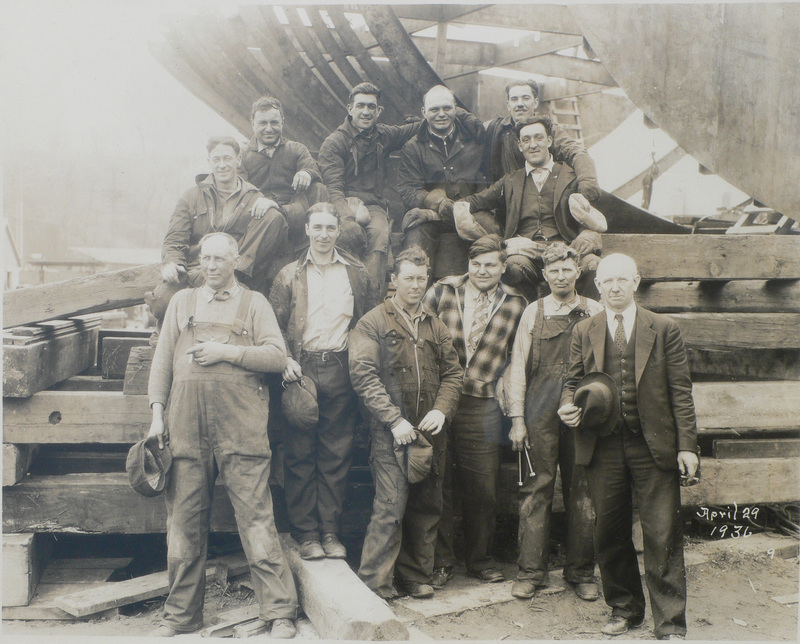 Fourth from the right in the center front is Murray Ryder, who worked first for General Ship & Engine Works and later the Winnipesaukee Steamship Company. If you are able to identify other members of the crew, please send us a note! 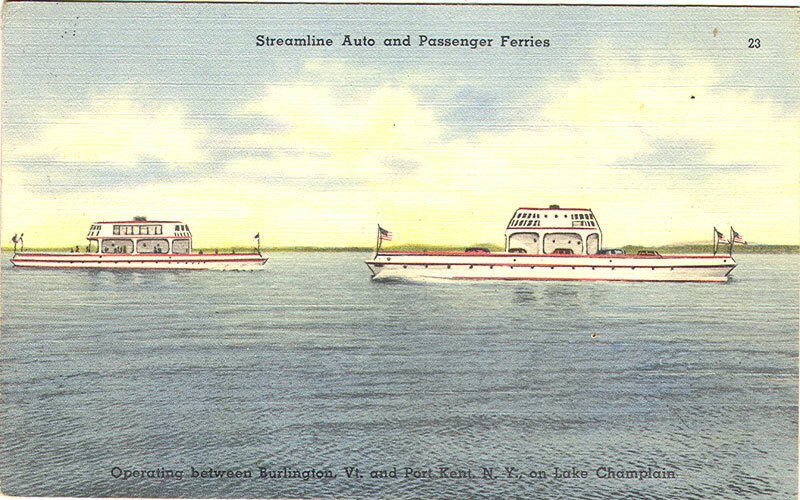 The City of Burlington and the City of Plattsburg operated between Burlington, Vermont and Port Kent, New York on Lake Champlain. One morning in 1935 Byron Hedblom found on his desk an urgent request to submit a set of plans for two ferries to be built in Vermont on Lake Champlain for Mr. Horace Corbin. Several days later, Hedblom took the train to Grand Isle, Vermont, where Corbin, owner of the Champlain Transportation Company lived. (Read Byron Hedblom's account of this meeting in snowy Vermont ). A contract to do the work was signed right in the midst of the Great Eastern Blizzard of 1936. All transportation halted and the electricity went out. Lake Champlain rose by eight feet. The weather made the Hedbloms somewhat concerned about conditions for construction of the ferry, but they moved to Burlington and began work. Byron and Doris's second daughter, Janet, was born there while work was under way on the project.